He was a member of the committee appointed to choose a flag for the future Lebanese state. After Independence, a number of deputies, in particular Saeb Salam and Henri Pharaon took it upon themselves to change the colours of the national flag. Michel Chiha was put in charge of incorporating its design with the symbolic and aesthetic aspects of the nation. 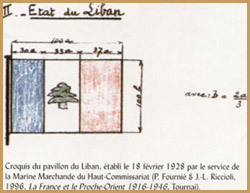 An earlier model/flag was not appropriate as a symbol of Lebanese independence because it featured a cedar tree in the middle of a white vertical band, an intrinsic feature of the French Republic’s emblem. It was unanimously agreed that a cedar tree should be placed in the middle of the new standard on a white central horizontal band and later agreed that two red horizontal bands would frame the white central band bearing the cedar of Lebanon. However, there was disagreement over the exact shade of red being proposed for the vertical framing bands and the actual shape of the cedar tree and Michel Chiha was of the opinion that the shade of colour extracted from murex shells by the Phoenicians of ancient Tyre and which was used to colour the bright senatorial togas of ancient Rome ought to be used on the flag. In order to resolve the matter, Michel Chiha consulted an English friend who in turn consulted the British Colour Council for the Coordination of Colour and Design. In Mai 1944, the British Colour Council replied saying that no one was sure of the exact shade of red used for senatorial togas. Nonetheless, they still had in their possession different samples of the colour crimson which they duly sent to him. As for the cedar tree, the stylized example that had been used on the country’s bank notes was also chosen to feature on the new national flag. 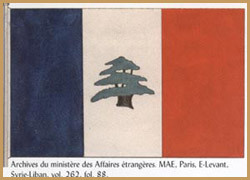 An earlier model/flag was not appropriate as a symbol of Lebanese independence because it featured a cedar tree in the middle of a white vertical band, an intrinsic feature of the French Republic’s emblem. It was unanimously agreed that a cedar tree should be placed in the middle of the new standard on a white central horizontal band and later agreed that two red horizontal bands would frame the white central band bearing the cedar of Lebanon.